Fitnex E70 Elliptical provides a low impact cardiovascular workout that can work both your lower body, upper body and your core. Exercising multiple areas allows you to burn more calories in a shorter amount of time. This is a very solidly built and smooth operating elliptical. You will have a very hard time finding a better built elliptical at this price point. The E70 Elliptical includes 16 levels of resistance and 8 challenging workout programs that include interval, weight loss, cardio, fatburn, heart rate control, rolling hills, random and manual. If you are in the market for a high quality, great functioning, low impact piece of exercise equipment, look no further. The E70 from Fitnex will help you achieve your fitness goals all within the comfort of your own home. 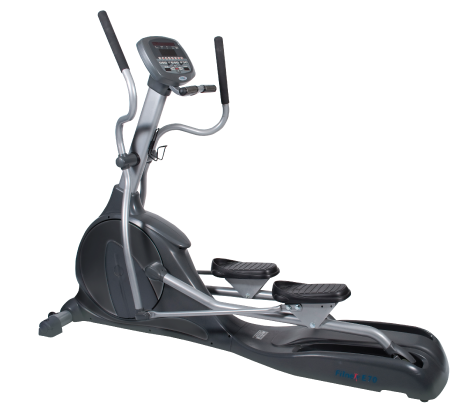 The Fitnex E70 elliptical is made with excellent quality. It is manufactured as a light commercial grade elliptical that is built to last. This product can be used in your home or in a light commercial setting. The E70 has both forward and reverse directional movement capability, 16 levels of resistance and 8 exercise programs. The pedals are extra wide for comfort and safety and has the ability to monitor you heart rate via the handles. 16 levels of resistance and 8 challenging workout programs: interval, weight loss, cardio, fatburn, heart rate control, rolling hills, random and manual. Its power is self generating. Max user weight capacity is 400 lbs. Be the first to review “Fitnex E70 Elliptical Exercise Machine” Click here to cancel reply.